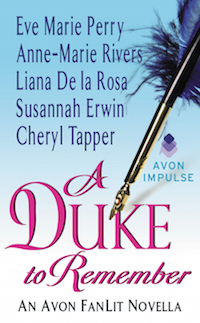 The final novella comprised of the five winning chapters from our 2015 Avon FanLit contest! For the first time, read all the 2015 Avon FanLit winning chapters as one amazing novella! When Maxwell Trent, Duke of Highclyff arrives at the ball of the season, Lady Felicity Stratford can scarcely believe her eyes or control her beating heart. Ten years ago, Max left Felicity in the wake of a scandalous duel and sailed off to the West Indies. 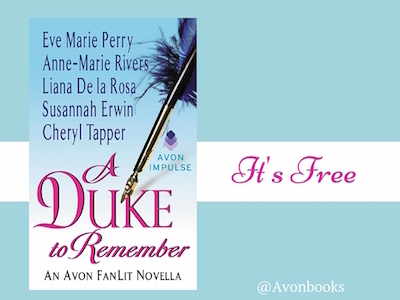 Having only just recovered her reputation and about to embark on a long-awaited engagement, the duke is the last man Felicity wants to see back in London, even if he is the only man she’s ever loved. Susannah Erwin is a former Hollywood studio executive who appreciates intelligent heroines, independent heroes and happy ever afters that leave the reader sighing. She lives in Los Angeles with her husband and one very curious cat. Cheryl Tapper and her husband live in South Eastern Pennsylvania, where they are doting parents to two Havanese pups who sometimes allow them the illusion that they have some level of authority in their own home. Links to website, blog, books, etc. Humm, sounds very interesting. Can’t wait to get a copy. What fun! I got the book. Can’t wait to read it. Thanks for stopping by, Tina. I hope you grabbed your own copy of today’s spotlighted book. 🙂 Happy Holidays!